Sourcing the Final Touches Is Easier than You Think. Over the years we have seen too many completed renovations where hardware seems like an afterthought. 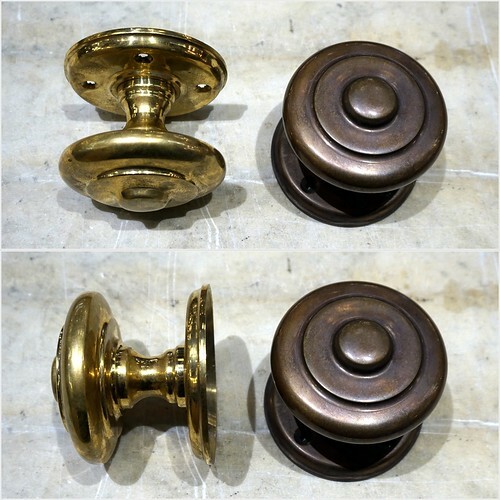 It’s such a shame when beautifully made or restored doors are appointed with lesser quality doorknobs and hinges, with little attention given to quality and detail. Just like the perfect fashion accessory, gorgeous hardware will complement and enrich the look you are creating, so it’s worth sourcing something special. At The Door Store we offer an alternative to commercially available hardware with both restored vintage hardware as well as several lines of unique reproduction alternatives. By using modern mechanisms and antique fittings our expert staff can help you customize door, window and cabinet hardware to give your home a personal touch without sacrificing security and function. Vintage door hardware is our passion, and The Door Store has one of the most impressive collections in Canada. With an inventory of tens of thousands of pieces we can help you outfit your entire home. Best of all, everything is fully restored, complete with screws and fasteners and in perfect working condition. And with decades of experience in the field, we are confident that we can help you achieve the look you’re after. Whether you’re building, renovating or restoring, our knowledgeable staff will be happy to advise you. A New Outlook for Old Hardware. We offer a complete service in bringing your old hardware back to life. Before you toss out your old hardware, bring in a sample and we will be happy to show you what we can do with it. You will be surprised at what can lie beneath the old rusted and painted facade! Repairs are usually possible, but because of the uniqueness and individuality of some of the parts, we can only try. Sometimes there is nothing left to be done but to replace the item, and chances are we have one just like it, or very close! Just ask. Our antique hardware collection is rounded out with a large and varied assortment of quality new and reproduction hardware: some ornate and unusual, and some everyday basic items. We carry a complete line of hardware accessories including, but not limited to, latches, hinges, bolts, doorstops, letter slots and doorknockers, and there are a number of finishes available. The most popular items can be found in our hardware gallery but the full collection is extensive. We’re working to get everything online, but in the meantime if you don’t see something you’re looking for, just ask.